Often referred to as “the teenage whisperer”, Hannah R. Goodman’s twenty-year career working with teenagers includes the titles teacher, tutor, coach, and, more recently, mental health counselor. Hannah has written essays about mental health for various online publications. Her work has appeared on MindBodyGreen, OC87 Recovery Diaries, Zencare.co, and The Mighty. Though she has previously earned the title author with her first three books, those were all were self-published. This time around, publisher Black Rose Writing released her novel Till It Stops Beating in July 2018. Literary Titan’s review praised Till It Stops Beating for “tackling a difficult issue like anxiety and making a story that was funny and sweet without making light of the issue.” DigiTerra (an imprint of Black Rose Writing) released the boxed set of the first three Maddie books (The Maddie Chronicles: Books 1-3) in December 2018. The Maddie Chronicles features three books in the series by Hannah R. Goodman: My Sister’s Wedding, My Summer Vacation, and Fear of Falling, a compelling collection in which readers encounter high school student Maddie Hickman who is determined to rediscover herself and pursue a life of meaning. But connecting with herself is an enterprise that is far from becoming a reality as she encounters obstacles in the form of an alcoholic sister and an ex-boyfriend who is anything but good. Follow her as she experiences a painful heartbreak, suffers broken relationships, and learns about family secrets. How can a young, fragile girl pull herself together and find meaning in the midst of chaos? Hannah R. Goodman’s writing is atmospheric, the plots revealing a gift for creativity that brings together relevant themes — family, love and loss, pain and recovery, summer camp and the challenges that young readers face as they strive to figure out who they are — into an interesting, engrossing read. The prose is elegant and I enjoyed the connection the protagonist has with her journal and how she creates a strong awareness of self by constantly confronting her own thoughts. This collection features very compelling and memorable characters: Zak, Justin, Barbara, Maddie, and, of course, the mysterious Bubbie. The narrative is injected with doses of realism and the characters are believable. The Maddie Chronicles is one of those series that get the reader’s attention from the very first exciting page and keep them turning to the next. It is psychologically and emotionally rich, stories that brilliantly explore social issues that young readers encounter as they grow up. A series with great entertainment potential. 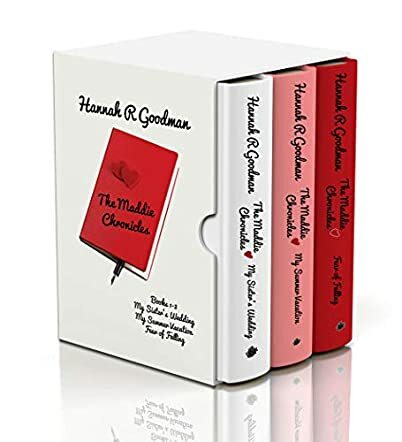 The Maddie Chronicles: Boxed Set, Books 1-3 is a collection of coming of age/social issues novels written by Hannah R. Goodman. This set includes: My Sister’s Wedding, My Summer Vacation, and Fear of Falling. In the opening book, My Sister’s Wedding, Maddie eventually realizes that running interference for her alcoholic older sister isn’t actually helping either one of them. Maddie’s fervent reading of self-help books gives her plenty of insights into others’ issues or, she comes to wonder, do they? In My Summer Vacation, Maddie goes off to summer camp for her second Counselor-In-Training term. Caleb’s Rock Creative Arts Camp was Maddie’s grandmother’s genius idea. Maddie’s love of writing, especially poetry, makes this camp, which she had been attending since sixth grade, a special fit for her. This summer, she was hoping to get over her breakup with Justin, her boyfriend, and her strained friendships with Peter and Susan. In Fear of Falling, Maddie takes a stand on gay rights and issues, not an easy thing to do, especially while Maddie is dealing with a profound and unreasoning grief. Hannah R. Goodman’s The Maddie Chronicles is well written and beautifully plotted. While not in the targeted audience for these books, I particularly enjoy coming of age novels and found The Maddie Chronicles to be some of the specimens of the genre that I’ve come across. Goodman explores so many issues that are important for people of any age, including alcoholism, loss, and acceptance of gays in school. Her characters are multi-dimensional, and their relationships are carefully explored. The plots of each story work very well. My favorite of the three books would have to be the middle book, My Summer Vacation. That book captures the magic of summer camp in all its complexity, magic and brevity. I had a grand time reading this collection, and I learned quite a bit from this wise and witty author. The Maddie Chronicles: Boxed Set, Books 1-3 is most highly recommended.